Richmond, in eastern Virginia, is a seaport at the head of navigation on the James River was first visited by Captain John Smith in 1607. Named after Richmond, a small town on the Thames in England, emigrants began settling in the area in 1637. In 1644 Fort Charles was built to protect the settlers from Native American attacks. Richmond became the capital of the Commonwealth of Virginia in 1779. Richmond was incorporated as a town in 1782 and as a city in 1842. During most of the American Civil War Richmond became the capital of the Confederacy. 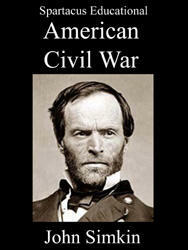 President Jefferson Davis established his government in the city and therefore became a major target of the Union Army. By the summer of 1862 the main Union Army under George McClellan was ready to march on Richmond. McClellan and his 115,000 men encountered the Confederate Army at Williamsburg on 4th May. McClellan moved his troops into the Shenandoah Valley and along with John C. Fremont, Irvin McDowell and Nathaniel Banks surrounded Thomas Stonewall Jackson and his 17,000 man army. Thomas Stonewall Jackson was under orders from President Jefferson Davis to try and delay the attack on Richmond. Jackson attacked John C. Fremont at Cross Keys before turning on Irvin McDowell at Port Republic. Jackson then rushed his troops east to join up with Joseph E. Johnson and the Confederate forces fighting George McClellan. In May, 1862, General Joseph E. Johnson with some 41,800 men counter-attacked McClellan's slightly larger army at Fair Oaks. The Union Army lost 5,031 men and the Confederate Army 6,134. Johnson was badly wounded during the battle and General Robert E. Lee now took command of the Confederate forces. Two months later George McClellan faced Robert E. Lee and Thomas Stonewall Jackson at Antietam. On 17th September, McClellan and Major General Ambrose Burnside attacked with over 75,300 troops against 37,330 Confederate soldiers. Lee held out until Ambrose Hill and reinforcements arrived. It was the most costly day of the war with the Union Army having 2,108 killed, 9,549 wounded and 753 missing. Abraham Lincoln now postponed attempts to capture Richmond and ordered McClellan back to Washington with the words: "My dear McClellan: If you don't want to use the Army I should like to borrow it for a while." In March 1865, William Sherman joined Ulysses S. Grant and the main Union Army at Petersburg. On 1st April Sherman attacked at Five Forks. The Confederates, led by Major General George Pickett, were overwhelmed and lost 5,200 men. On hearing the news, Robert E. Lee decided to abandon Richmond and join Joseph E. Johnson in an attempt to halt Sherman's army in South Carolina. President Jefferson Davis, his family and government officials, was forced to flee from Richmond. The Union Army took control of Richmond and on 4th April Abraham Lincoln entered the city. Protected by ten seamen, he walked the streets and when one black man fell to his knees in front of him, Lincoln told him: "Don't kneel to me. You must kneel to God only and thank him for your freedom." Richmond recovered rapidly after the American Civil War. The city is a major tobacco market and a banking centre. It now covers a land area of 155.7 square km (60.1 square miles). Population increased to 219,214 in 1980 but then went into decline and by 1998 had fallen to 194,173. According to the 1990 census blacks constitute 55.4 per cent of the population.